Ulster have signed Springboks forward Pedrie Wannenburg on a two-year deal. The Bulls player, who has played 20 times for South Africa, made headlines earlier this year when it was revealed that he had taken cocaine. However, Wannenburg regrouped from the media storm to produce a series of excellent performances for the Bulls. The 29-year-old's move to the Irish province was announced on Wednesday after Ulster confirmed that Xavier Rush is remaining at Cardiff. Rush agreed a two-year deal with Ulster back in February but subsequently changed his mind. Ulster have released Rush from the contract after the player requested that, for personal reasons, he did not wish to leave Cardiff. "Ulster are a great team with a bright future. I was very impressed with the set-up when I visited and I wish them the best of luck for the forthcoming season," said Rush. "However, a change in my personal circumstances has resulted in me deciding to recommit with what has become my home from home, with the Cardiff Blues, where I am very happy." Wannenburg became the first player to make 100 appearances for the Bulls this year. 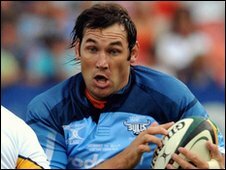 He has won three Super 14 titles with the Bulls and was a member of the Blue Bulls side that won the Currie Cup five times. "It was not an easy decision after almost a decade with the team and the Bulls family," said Wannenburg. "But it is also a good time to move on - the Heineken Cup will be a new challenge and I am looking forward to that. "I have heard many good things about Ulster and I am keen to contribute to them, as I still have a lot to offer." The Bulls knew about Wannenburg's drug taking prior to it becoming public and the club then did independent testing on the former Springbok, who also confessed to abusing alcohol. Ulster have already signed South African duo Johann Muller and Ruan Pienaar for next season.